The Border Collie is a well balanced, medium-sized dog of athletic appearance, displaying style and agility in equal measure with soundness and strength. Its hard, muscular body conveys the impression of effortless movement and endless endurance. The Border Collie is extremely intelligent, with its keen, alert expression being a very important characteristic of the breed. Any aspect of structure or temperament that would impede the dog’s ability to function as a herding dog should be severely faulted. 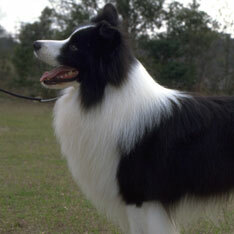 The Border Collie is, and should remain, a natural and unspoiled true working sheep dog whose conformation is described herein. Honorable scars and broken teeth incurred in the line of duty are acceptable.